Our company has been in business since 1985. We believe in the Golden Rule, "Treat people the way we would like to be treated". We actually try to treat our customers like we would treat our family! We try to simplify the moving process by offering one fair price that includes everything! We started out with one small truck and the three of us doing the handful of moves we'd get each month. Now, we have grown to 3 large, professionally equipped, Bobtail moving trucks, One Big rig tractor, four trailers and 12 + crew members! We choose only the best movers, who work hard, fast and get the job done to save you time and money - not to mention saving your back - and we guarantee you’ll have a BETTER moving experience by using BEST MOVE! 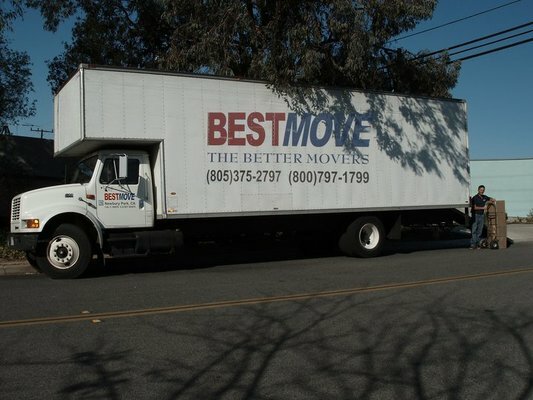 We are grateful for having professional, well trained moving crew members working for us at BEST MOVE. Currently, 8 of our movers have been with us 3 years or more, 2 have been with us over 6 years and Frank and Stuart have been with BEST MOVE over 12 years! (Thanks guys!) All of our guys have the rare ability to work hard, doing one of the most physically challenging jobs on earth, and keep a great attitude with a smile on their faces!